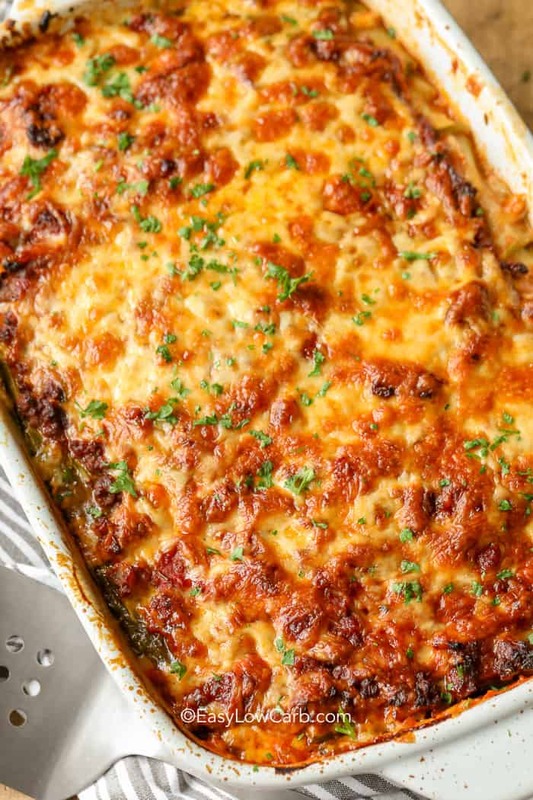 Who would have thought a low carb zucchini lasagna could have all the melty, cheesy goodness of a traditional lasagna without all those carbs? Serve it alongside a keto caesar salad for the perfect dinner! When the whole family gets together you can be sure this dish will satisfy any palate…even the pickiest of eaters! The key to this healthy lasagna dish is perfectly sliced zucchini and lots of delicious parmesan and ricotta cheese. 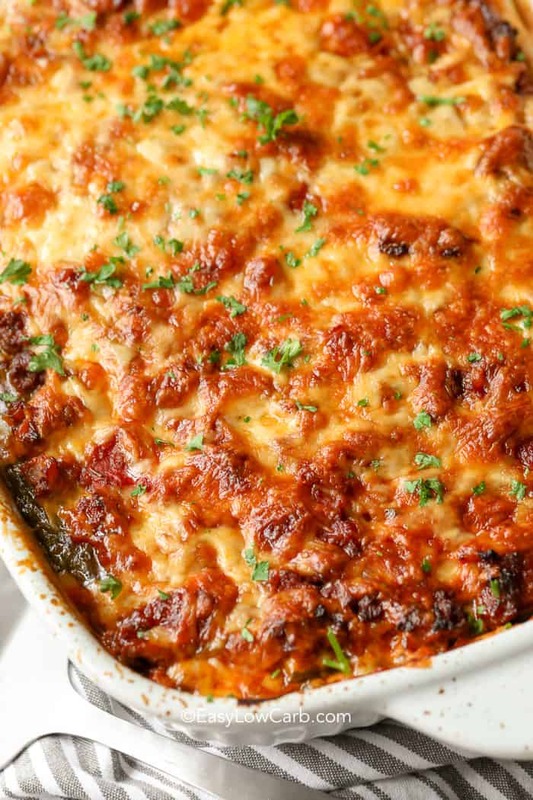 With fall upon us, this no noodle lasagna casserole will be a hit with everyone in the family! Going to a family get together? Game Night? Open House? Zucchini Lasagna is easily reheated and doesn’t need a lot of fuss. Just cut like a regular lasagna and watch it disappear! Added bonus when guests find out it’s, low carb and even keto friendly! Guests also love this alongside Dill Dip with some fresh vegetables. 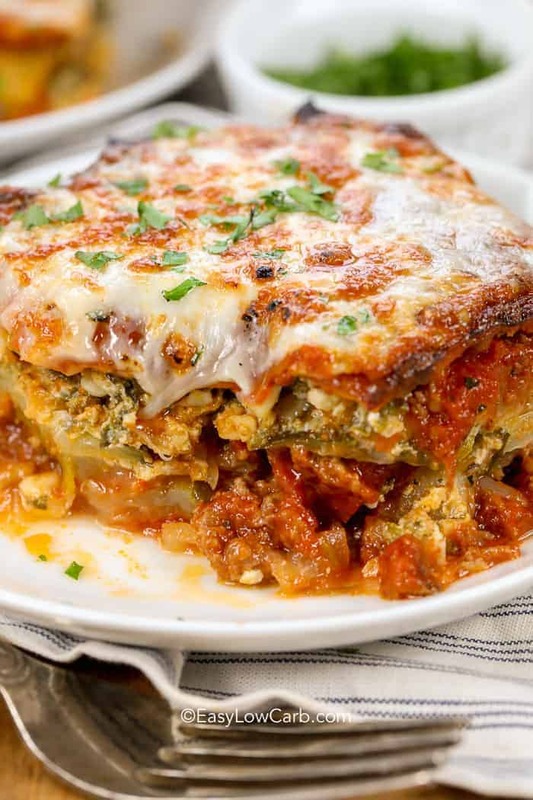 Zucchini Noodle Lasagna recipes seem to be all over the internet these days, but this very special take is not only low carb and keto, but a great way to use up that end of summer bounty of garden zucchinis you’ve been wondering what to do with! It’s a shame to toss them into the compost pile. With minimal knife skills, you can transform those veggies into a delicious feast! Instead of traditional flour lasagna pasta sheets, slice zucchini horizontally with a mandolin or sharp knife. A potato peeler will make the slices too thin. Slice each zucchini about ¼” thick. The zucchini noodles should cook for 10-15 minutes in the oven to soften before you use them. Carefully remove the strips from the oven and lay them on a paper towel to soak up any water left in them before you layer the zucchini lasagna! If you’re wondering how to make a zucchini lasagna, just remember sometimes keeping it low key is best. With just a few simple ingredients, this delicious casserole is perfect for any day of the week! Add a green side salad and a glass of vino and you’ve got a healthy weeknight option and leftovers for work the next day! Put a small amount of sauce on the bottom of a greased 9”x 13” casserole dish. Then spread each strip with the spinach/parm/ricotta filling from one end to the other. Add a little sauce. Keep layering and then top the final layer with a little sauce, some sprinkled parmesan and maybe even some sliced black olives for color! 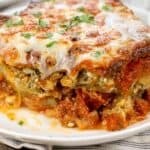 This is an easy keto lasagna that delivers an Italian hearty flavor that is low carbs! 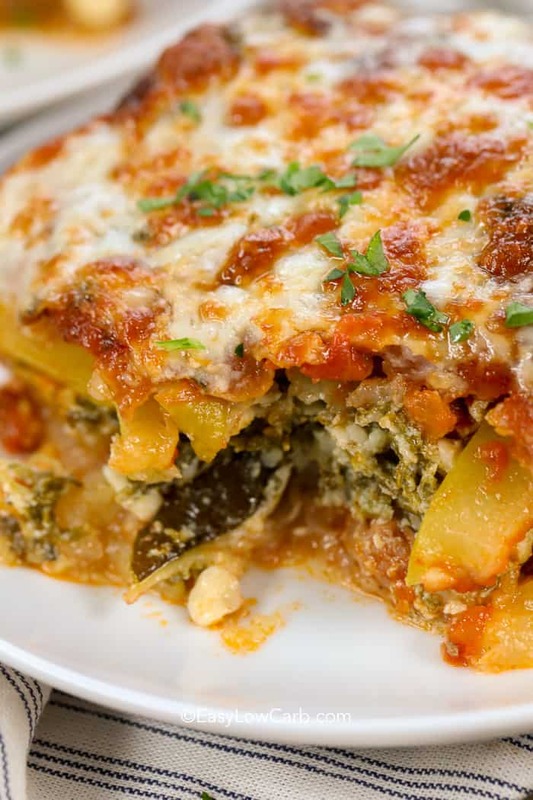 For weekend prepping, freeze a batch of this zucchini lasagna recipe and just defrost it in the fridge until it is time to bake it! In no time, a healthy and delicious meal is ready to go! 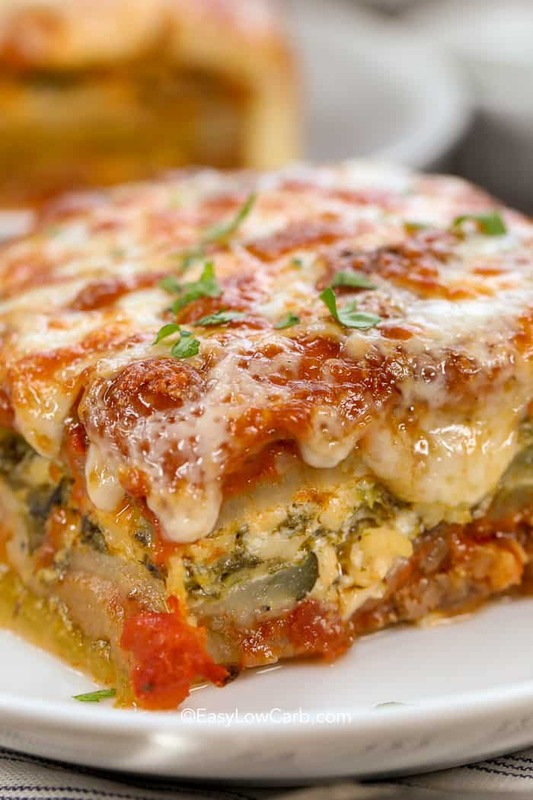 Who would have thought a low carb zucchini lasagna could have all the melty, cheesy goodness of a traditional lasagna without all those carbs? Cook zucchini in a 400˚ F oven for 10-15 minutes to soften. Scramble fry the ground beef, sausage and onion till brown. Add 1 cup pasta sauce, diced tomatoes and Italian seasoning. Heat through. In a medium bowl, mix together the beaten eggs with the cottage cheese. Add the spinach and parmesan cheese and nutmeg. Pour 1/2 cup pasta sauce on the bottom of a 9 x 13" pan. First layer the zucchini, meat sauce, layer of zucchini, cottage cheese mixture, zucchini, final layer of meat sauce and a final layer of zucchini. Top with remaining 1/2 cup pasta sauce. Bake uncovered in a 350˚F oven for 1 hour. Cover with mozzarella cheese and continue to bake until cheese is brown and bubbly. Above recipe only calls for one zucchini. Is this correct? Yes, this recipe calls for 1 zucchini.